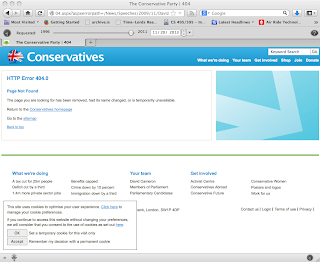 Circulating the web last week the story of the UK's Conservative Party (aka the "Tories") removing speeches from their website (see Note 1 below). Not only did they remove the speeches from their website, but via their robots.txt file they also blocked the Internet Archive from serving their archived versions of the pages as well (see Note 2 below of a discussion of robots.txt, as well as for an update about availability in the Internet Archive). But even though the Internet Archive allows site owners to redact pages from their archive, mementos of the pages likely exist in other archives. Yes, the Internet Archive was the first web archive and is still by far the largest with 240B+ pages, but the many other web archives, in aggregate, also provide good coverage (see our 2013 TPDL paper for details). 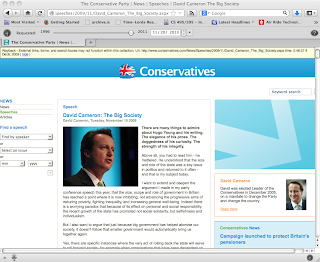 So it seems clear that this speech will not disappear down a memory hole. But how do you discover these copies in these archives? 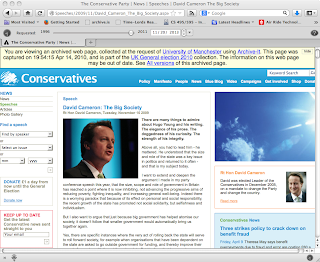 Fortunately, the UK Web Archive, Archive-It, and Archive.is (as well as the Internet Archive) all implement Memento, an inter-archive discovery framework. If you use a Memento-enabled client such as the recently released Chrome extension from LANL, the discovery is easy and automatic as you right-click to access the past. curl -i http://mementoproxy.lanl.gov/aggr/timemap/link/1/http://www.conservatives.com/News/Speeches/2009/11/David_Cameron_The_Big_Society.aspx HTTP/1.1 200 OK Server: nginx/1.2.8 Date: Wed, 20 Nov 2013 23:37:46 GMT Content-Type: application/link-format Transfer-Encoding: chunked Connection: keep-alive ;rel="original" , ;rel="memento"; datetime="Tue, 08 Dec 2009 02:48:37 GMT" , ;rel="memento"; datetime="Wed, 14 Apr 2010 19:54:15 GMT" , ;rel="memento"; datetime="Fri, 30 Apr 2010 00:37:36 GMT" , ;rel="memento"; datetime="Wed, 02 Jan 2013 06:28:52 GMT" , ;rel="timegate" , ;rel="self"; type="application/link-format"; from ="Tue, 08 Dec 2009 02:48:37 GMT";until="Wed, 02 Jan 2013 06:28:52 GMT"
The nice thing about the multi-archive access of Memento is as new archives are added (or in this case, if the administrators at conservatives.com decide to unredact the copies in the Internet Archive), the holdings (i.e., TimeMaps) are seamlessly updated -- the end-user doesn't have to keep track of the dozens of public web archives and manually search them one-at-a-time for a particular URI. Download and install the Chrome extension and all of these archives and more will easily available to you. 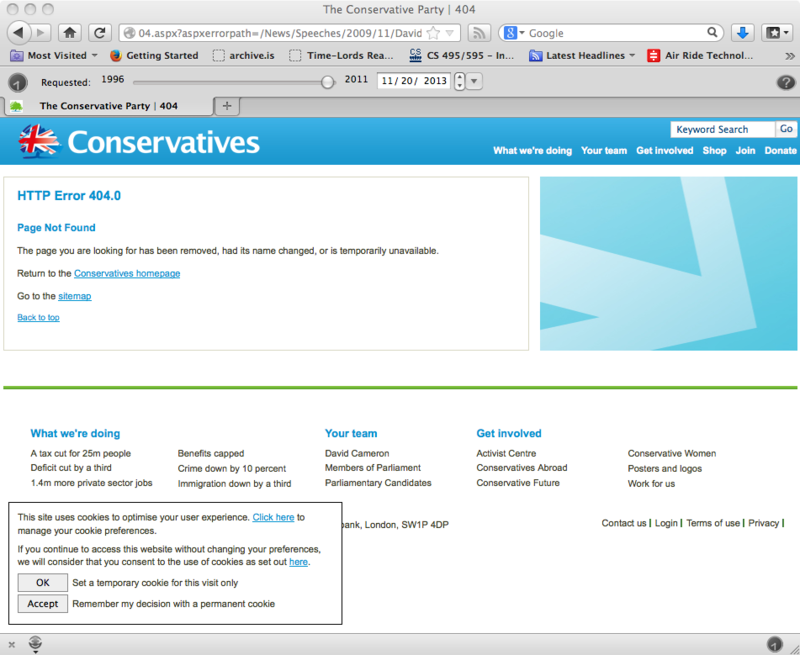 Note 1: According to this BBC report, the UK Labour party also deletes material from their site, but apparently they don't try to redact from the Internet Archive via robots.txt. 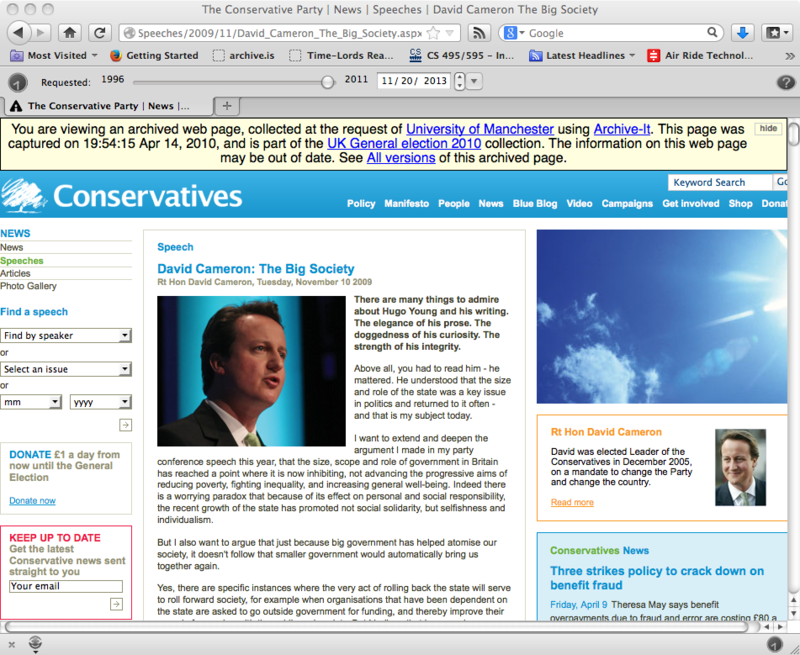 For those who are keeping score, David Rosenthal regularly blogs about the threat of governments altering the record (for example, see: June 2007, October 2010, July 2012, August 2013). "We've always been at war with Eastasia." These "Disallow" rules no longer match the URI of the original speech. I guess the Internet Archive cached the disallow rule and it just now expired one week later. See the IA's exclusion policy for more information about their redaction policy and robotstxt.org for details about syntax. 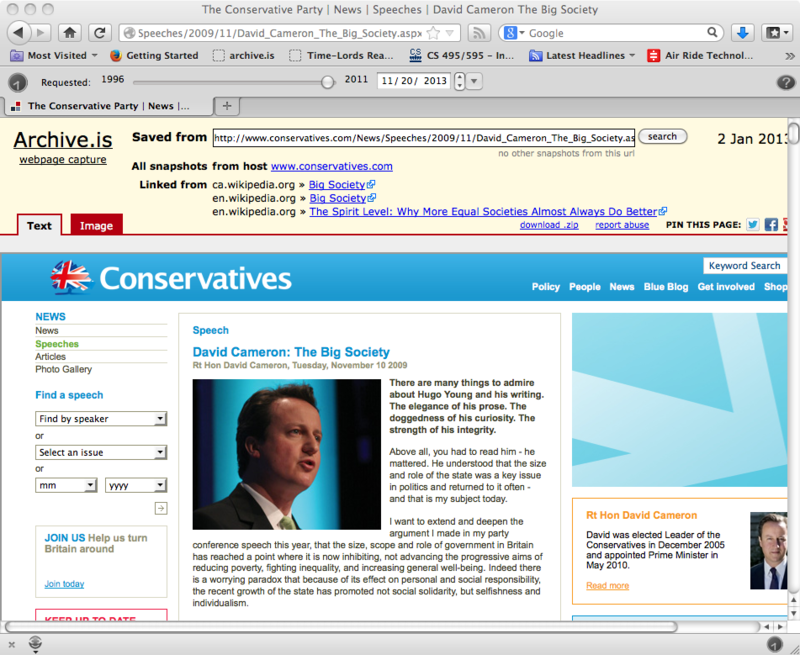 curl -i http://mementoproxy.lanl.gov/aggr/timemap/link/1/http://www.conservatives.com/News/Speeches/2009/11/David_Cameron_The_Big_Society.aspx HTTP/1.1 200 OK Server: nginx/1.2.8 Date: Thu, 21 Nov 2013 04:54:59 GMT Content-Type: application/link-format Transfer-Encoding: chunked Connection: keep-alive ;rel="original" , ;rel="memento"; datetime="Fri, 13 Nov 2009 14:41:56 GMT" , ;rel="memento"; datetime="Sun, 15 Nov 2009 09:23:25 GMT" , ;rel="memento"; datetime="Tue, 08 Dec 2009 02:48:37 GMT" , ;rel="memento"; datetime="Thu, 11 Mar 2010 20:49:24 GMT" , ;rel="memento"; datetime="Wed, 14 Apr 2010 19:54:15 GMT" , ;rel="memento"; datetime="Fri, 30 Apr 2010 00:37:36 GMT" , ;rel="memento"; datetime="Wed, 04 May 2011 02:24:06 GMT" , ;rel="memento"; datetime="Wed, 22 Jun 2011 06:27:40 GMT" , ;rel="memento"; datetime="Wed, 29 Jun 2011 02:53:46 GMT" , ;rel="memento"; datetime="Wed, 26 Oct 2011 22:41:26 GMT" , ;rel="memento"; datetime="Fri, 28 Oct 2011 18:41:31 GMT" , ;rel="memento"; datetime="Sat, 26 Nov 2011 19:59:22 GMT" , ;rel="memento"; datetime="Tue, 27 Dec 2011 21:37:40 GMT" , ;rel="memento"; datetime="Fri, 27 Jan 2012 20:40:27 GMT" , ;rel="memento"; datetime="Wed, 08 Feb 2012 20:00:18 GMT" , ;rel="memento"; datetime="Fri, 02 Mar 2012 18:02:34 GMT" , ;rel="memento"; datetime="Tue, 06 Mar 2012 04:16:05 GMT" , ;rel="memento"; datetime="Wed, 14 Mar 2012 08:32:13 GMT" , ;rel="memento"; datetime="Thu, 10 May 2012 13:52:48 GMT" , ;rel="memento"; datetime="Sat, 14 Jul 2012 07:01:01 GMT" , ;rel="memento"; datetime="Sat, 20 Oct 2012 12:30:16 GMT" , ;rel="memento"; datetime="Sun, 21 Oct 2012 10:19:09 GMT" , ;rel="memento"; datetime="Sun, 25 Nov 2012 07:47:32 GMT" , ;rel="memento"; datetime="Wed, 02 Jan 2013 06:28:52 GMT" , ;rel="memento"; datetime="Fri, 15 Mar 2013 13:49:17 GMT" , ;rel="memento"; datetime="Thu, 21 Mar 2013 20:14:57 GMT" , ;rel="memento"; datetime="Mon, 25 Mar 2013 01:29:16 GMT" , ;rel="memento"; datetime="Tue, 02 Apr 2013 09:39:38 GMT" , ;rel="memento"; datetime="Mon, 08 Apr 2013 04:24:02 GMT" , ;rel="memento"; datetime="Tue, 27 Aug 2013 09:45:25 GMT" , ;rel="timegate" , ;rel="self"; type="application/link-format"; from ="Fri, 13 Nov 2009 14:41:56 GMT";until="Tue, 27 Aug 2013 09:45:25 GMT"
See our 2013 TempWeb paper for a discussion about redirecting URI-Rs and which values to use as keys when querying the archives.